Your business is competing in the most competitive marketplace the world has ever seen, the internet. Google is the referee who determines website winners and losers, except that this referee also establishes the rules of the game. In the U.S., Google is the search engine of choice for about 75% of all searches. 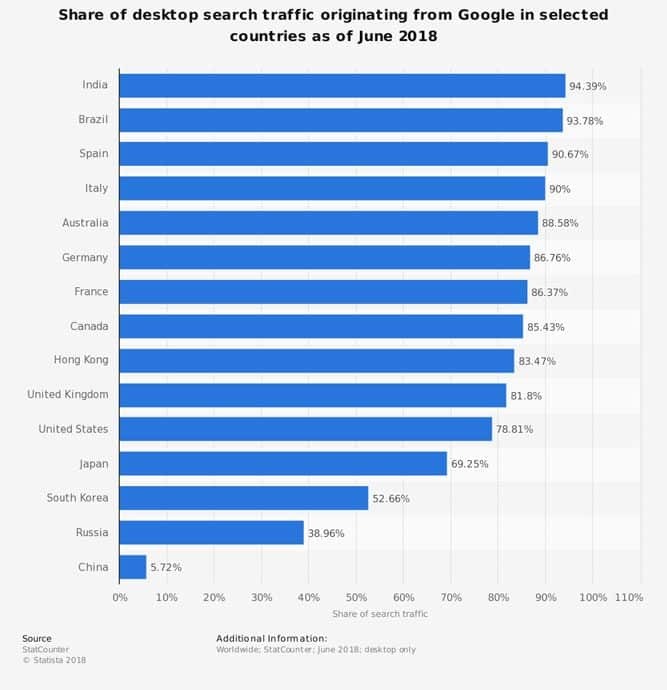 In India, almost everyone (95%) uses Google. The wizards at Google write the algorithms that determine how your website will be ranked against your competitors when someone is looking for a product or service. Websites around the world are constantly being crawled or examined by search engines. The information they retrieve on multiple factors is used to update their massive, world-spanning database. We talk about this subject a lot, but it’s THAT important. So let’s get more in depth on the ranking factors Google considers important in 2018 and beyond. How Important is Your Google Ranking? When you’re searching for information, a product or a service, how do you select which links to click on? If you’re like most people, you glance first at the block of text at the top of the search engine results page (SERP), the featured snippet. If your company’s link is underneath that information, you’re going to get a lot of targeted traffic. You will also get a lot of organic (unpaid) traffic if your company is one of the top three listings underneath the featured snippet. The other six or seven listings on the first page of the SERP receive fewer clicks. Companies not on the first page of the results for a particular search phrase receive very few clicks. SEO (search engine optimization) is used to optimize your website so that Google finds what it considers positive elements. These factors determine a website’s ranking. Some of the most important are discussed below. Search intent, or defining the information the searcher is looking for has become a critical ranking factor. Google’s objective is providing the most relevant answer to the search query. Words can have multiple and very different meanings. The word “nail” could refer to a fingernail or a construction nail. 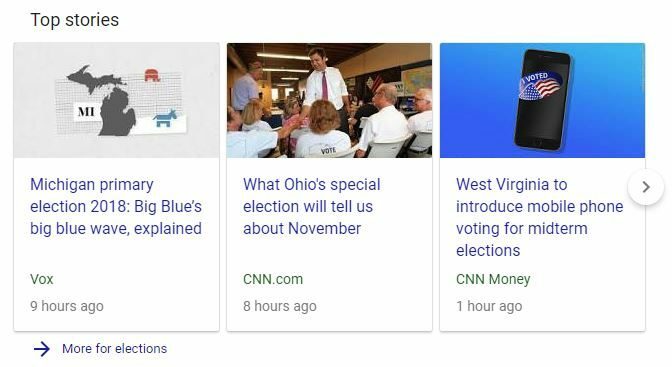 Google wants to determine the intent of the user in this instance and display the most relevant information. Keywords or keyword phrases (long-tail keywords) are important elements in determining intent. Suppose you sell athletic shoes. The keyword “shoes” by itself is too vague to be useful and won’t generate leads. However, if a searcher types “women’s running shoes size 8”, they’re looking for what you sell, not an article on the history of shoes. Voice search is increasingly important and changes how how search queries are phrased. Keyword research becomes more complex, but is more important than ever. Schema markup is special coding on a website that helps search engines return better results for users. Sounds great, but what does it mean to you? Would you like your company’s information listed at the very top of the search engine results page in the featured snippet box, raising your ranking and bringing you all that extra traffic? The right coding could help you achieve your goal. Google loves featured snippets and just expanded their features. Suppose you manage a nightclub or an organization that holds regular events. If your website is properly coded, upcoming entertainment or events would be displayed. Coding could be used to promote a sale or your name as the author of a blog or how-to, adding to your authority as an expert in your field. This coding has many applications, useful for local business information, product pages, your aggregate rating and much more. To learn a little more about how this works, visit schema.org, a rare collaborative effort of Google, Bing and Yahoo. If your website isn’t responsive, or mobile-friendly, Google will punish you for having outdated web design by not showing your website as predominantly on phones and tablets. Google’s ranking algorithm, dubbed ‘Rank Brain’, will choose to show your competitors who’s sites look good and function properly on mobile devices instead. Make sure you’re not being penalized by Google for not having a website optimized for mobile devices by using Google’s tool, the Mobile-Friendly Test. This will tell you plain and simple if Google can read your site properly on mobile devices. If your site fails this test, there’s a good chance you’re missing out on opportunities to be shown to people searching on their phones for businesses like yours. Google wants to provide the best search experience to their users. If they didn’t show searchers the best results for what their users are looking for, they wouldn’t be the top search engine in the world. Your landing page is what a visitor sees when first arriving at your website. It needs to clearly provide the information the visitor is looking for. The layout of the page, font, placement of visuals (videos, pictures, etc. ), text, CTA (call-to-action) buttons and other data are all important and should be optimized for both search engine and visitor. How do you know what works best? You run split or A/B tests, finding out whether you get more clicks with this or that CTA text or location, for example. The click through rate (CTR) is commonly used to measure the success of an advertising campaign. It’s the ratio of how many people click on a link vs. how many viewed the page, ad or email. Generally, the higher the CTR, the better performing your ad copy is. However, the CTR only indicates how many people went to the page. It doesn’t tell you how many converted. Obviously, you want to increase your CTR of targeted visitors, but don’t focus on increase CTR while ignoring other important metrics. You need to be testing and experimenting with the landing page to make sure that you’re getting the best bang for your buck with every click. Bounce rate is the flip side of click through rate. Did visitors quickly find the answer to their search query or did they “bounce” or abandon your website? Are they visiting other pages on your website after they find what they’re looking for? A well-optimized website will lower your bounce rate, giving you the opportunity to generate a lead or a sale. The longer a visitor stays on your site, the better your site will look in Google’s eyes. 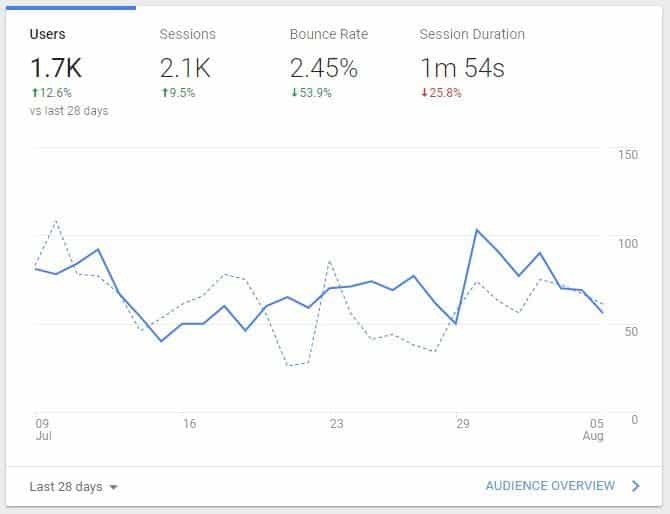 A consistently low bounce rate will help improve your rankings over time by providing visitors with the information they’re looking for. What Should My Bounce Rate Percentage Be? The title often determines whether or not someone clicks on a link and must be SEO-friendly. Your title should cover what that specific page is about in an enticing way. 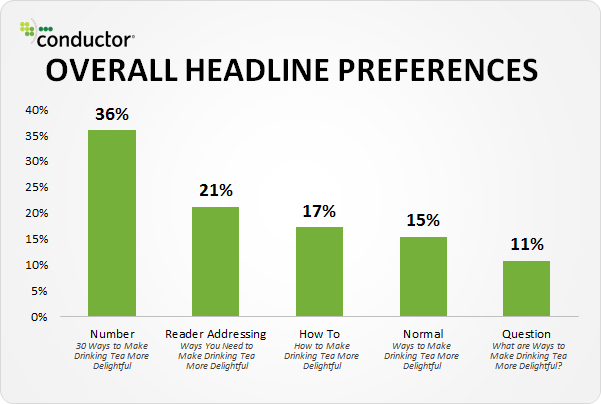 Using a numbered list for your title has been shown to increase CTR as much as 36%. Testing can determine which title generates the most clicks. It is estimated that on average 80% of people never make it past the headline. Give them a reason to click through to your site. A meta description provides a short summary of your page’s content. While Google doesn’t consider it an important ranking factor, they matter in on-page SEO. 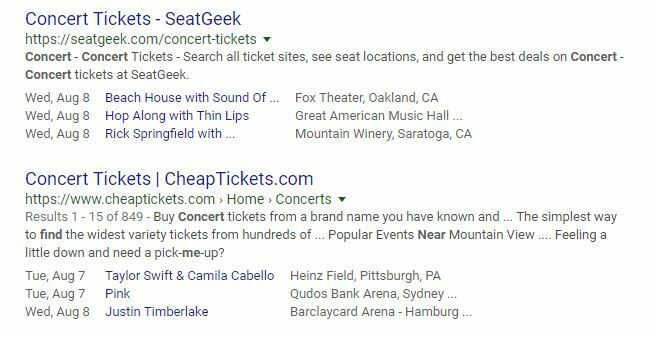 A meta description acts as an ad for your content when a searcher is deciding which link to click on and can increase clicks. If more visitors are clicking on your links in the search results because of your enticing titles or meta descriptions, this will have an indirect affect on your rankings. 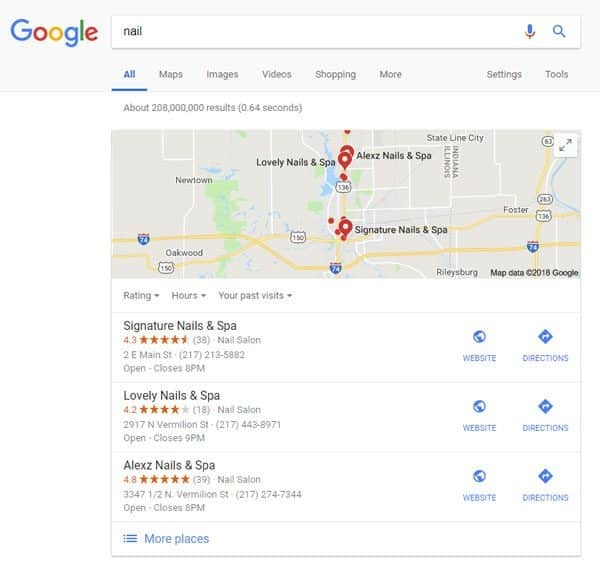 Google will see more people clicking on your result instead of your competitors, and will over time grant you higher priority in that search. Backlinks are important. Simply put, they’re links from one webpage/website to another. Links to your website from another authoritative website in your industry are especially valuable, increasing your authority as an expert. This helps improve your Google ranking and brings you more business. The quality of backlinks is much more important than quantity. You can’t (well, shouldn’t) get backlinks from just anywhere. They must be “real sites” (not built purely to provide you links), relevant to your industry, get real traffic, and provide value to their visitors / readers. 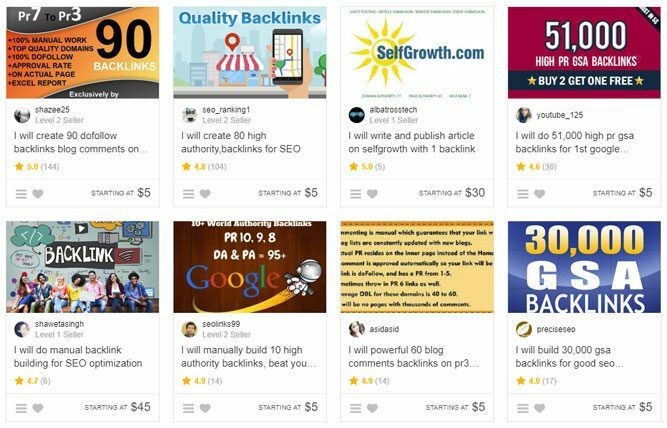 We have dealt with clients who have purchased bulk backlinks on service providers like Fiverr and were dealt the swift hand of death by Google. This caused their site to get “de-indexed” from Google’s search results page, which means NO ONE is finding you there now. Not on the first page, and not on the 600th page. Please, whatever you do, do NOT purchase backlinks from these types of service providers. 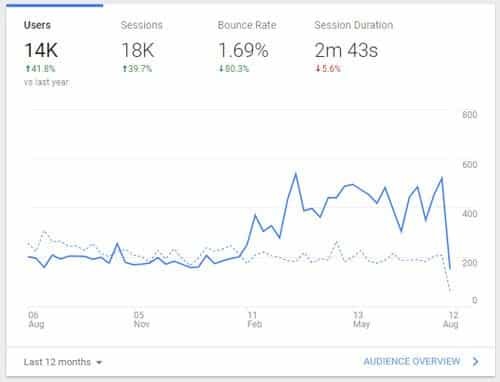 This is one of the quickest ways to get your website penalized by Google and potentially lose a huge percentage of your organic traffic. How long does it take to improve your google ranking? At AWEBCO, how long it takes is one of the questions we’re asked most often. That’s hard to say, but it doesn’t happen overnight. It may take three or six months before you see substantial improvement. However, consider the possibilities after a year of steady progress. Why choose AWEBCO? We’ll always put your needs first because your success is our success. We’re a team of experienced web designers and SEO experts, offering the digital marketing services you need to grow your business online. Don’t settle for a website that is either stuck in the past or not getting you the results you need. You’ve got enough to do running your business. We’re proud of our work. Take a look and contact us for a free quote. Increase your traffic, show up higher and in more Google search results, and earn more business with SEO by AWEBCO. Get an instant quote for your project then schedule a one-on-one meeting with our team to see if AWEBCO is the right fit for you.